From junior golf to college golf to an outstanding amateur career, and an all-too-brief but highly accomplished professional career, Eddie Fryatt has been a big-time winner all the way. After capturing nearly every title as a junior golfer in Southern Nevada, Fryatt went on to become a three-time All-American at UNLV, was the Southern Nevada Amateur of the Year three-straight years, and was the Las Vegas City Amateur champion five-straight times. 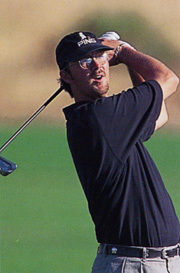 He also won the Nevada State Amateur title in 1992. As a professional, Fryatt won five times around the globe in the late 1990s, including four national opens. When he earned his way onto the PGA Tour in 2000 through the Nike circuit, he had five top-ten finishes, including a third at the MCI Classic at Harbor Town, a fifth at Hartford and a seventh at Phoenix. For a time, Fryatt was also the holder of an all-time PGA Tour record of recording eight consecutive birdies. The record was broken in 2009 by Mark Calcavecchia.